I really have tried to tame my game, but this affinity is far too powerful and resistance futile. Actually, I hope you not only understand my infatuation, but are savoring every bit of this almond-flavored marathon with me. See those little pans? They sort of jumped into my cart while I was strolling around IKEA a couple weeks ago and I just did not have the heart to deny them a loving home. I am nothing if not charitable. I had been planning to make an almond cake for several weeks, but when I saw these little pans, I knew that my plans for one cake were going to become two. This cake is so moist that it will last in the refrigerator for days. I should say could last several days, because that is a theory that you will never get a chance to test seeing as how snack-able this cake truly is. These airy cakes are doused with a sweet, amaretto syrup, hence their longevity. The syrup permeates the cakes as they chill, leading to a faintly sweet, luxuriously moist cake. Served alongside a dollop of vanilla whipped cream and a steaming cup of tea, there is really nothing better. Plus, you have a cake for a friend if you feel like sharing, or need to apologize for how much your puppy chewed on them. Something about these delicate flavors feels so spring-y. This cake would be so excellent for Easter. In fact, it is what I am planning to make. It is just sweet enough to make it a welcome break from all the marshmallow Peeps and malted milk eggs. If you do not happen to have two tiny bundt pans laying around, this recipe will do just fine in a full-sized tin. Cook's Note: I baked my cakes in these miniature bundt pans from IKEA. However, you can use just about any decorative bundt pan you have laying around. Just be sure to only fill whatever pan you use 3/4 of the way full, otherwise the batter will overflow. With the mixer on medium speed, beat in eggs, one at a time, scraping down the sides as needed. Beat in sour cream, almond extract, and amaretto. In a large mixing bowl, whisk together flours and leavening. With the mixer on low speed, mix in the flour in two additions. Beat until pale and smooth. Spray your pan or pans liberally with nonstick baking spray. Fill 3/4 of the way full with batter. If using small bundt pans, you might have a little batter leftover. Tap the pans on the counter to remove any air bubbles and bake for 45 minutes, if using the small pans or 50-55 minutes if using a full-sized bundt pan. The cake should be deep golden in color and a skewer inserted into the center of the cake should come out clean. Transfer the pan(s) to a cooling rack and allow to cool until just barely warm while you prepare the syrup. 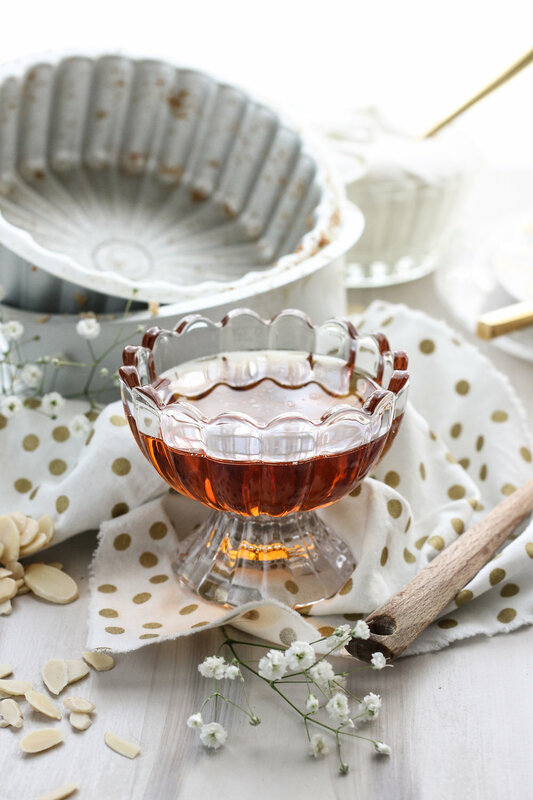 Combine water, amaretto, and granulated sugar in a small saucepan and set over medium high heat. While stirring constantly, bring the mixture to a simmer. Simmer for five minutes and remove from heat. 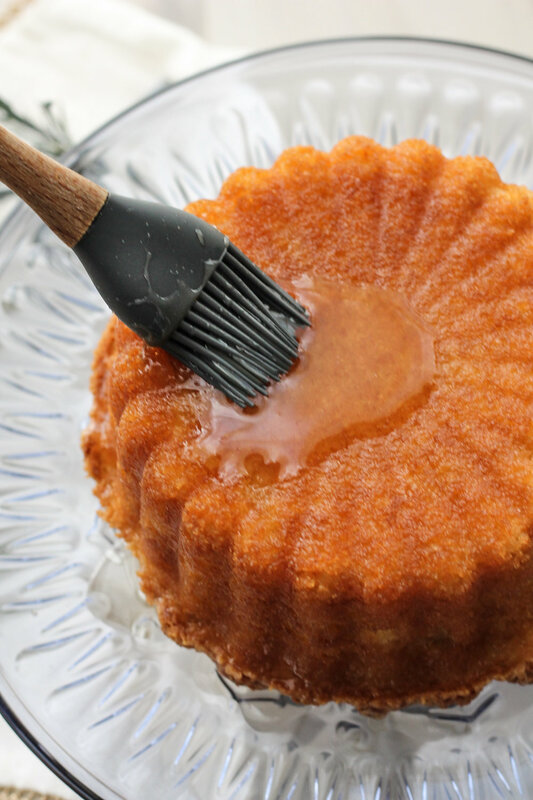 Use a pastry brush to coat the cooled cake or cakes with the syrup. It will look like you have far too much syrup, but if you work slowly, the syrup will soon seep into the cakes. Cover tightly with plastic wrap. Refrigerate overnight. 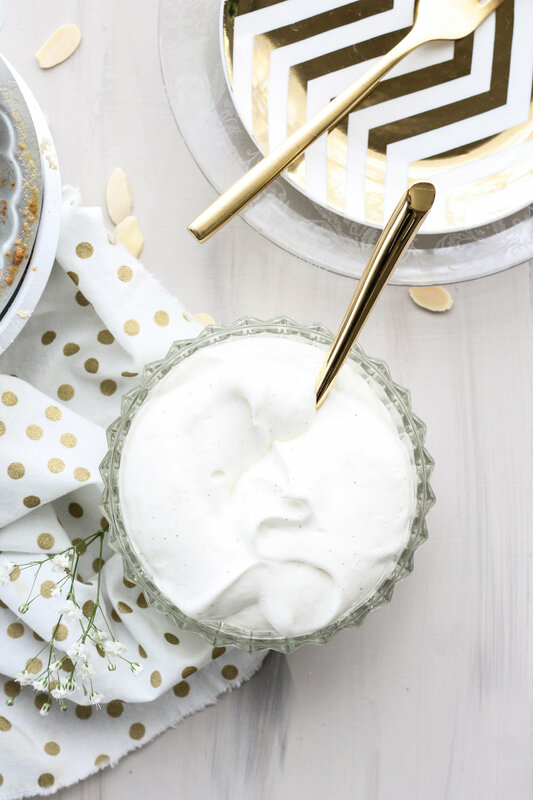 Serve cold with freshly whipped cream, if desired.